It’s no secret that the Obama administration badly wants a nuclear deal with Iran. And it’s no secret that the Iranians are playing hard to get. The talks, which were supposed to yield a final agreement this week, have been extended to July. That’s a relief, because right now, the best deal is no deal. Many of the finest minds in strategy and physics have spent years arguing over the parameters of a deal with Iran. But it’s easy to overthink this problem. We know what nations that give up on nuclear weapons programs look like. They look nothing like Iran. The United States has done a lot of good work to limit the spread of nuclear weapons. We discouraged Taiwan and South Korea from going nuclear. After the Soviet Union fell, we encouraged, and paid, the former Soviet states of Ukraine, Kazakhstan and Belarus to get rid of the Soviet nukes they had inherited. We supported confidence-building efforts between Brazil and Argentina that ended their nuclear rivalry. In the 1990s, our pursuit of Iraq’s nuclear program persuaded South Africa to come clean about its nuclear stash. In 2004, during the Iraq War, we frightened Moammar Gadhafi into giving up Libya’s program. But all of these places either went through a democratic transition, or — in Libya’s case — were scared into doing the right thing. Fundamentally, they came clean about their nuclear programs of their own accord. While we offered incentives, our incentives were never decisive. We’ve offered loads of incentives to North Korea to give up its nuclear weapons, with no success. We’ve never been able to bribe or talk nations into giving up nuclear weapons: They usually give up nukes because they have newly free political systems and no longer want to have the bomb. None of this is true of Iran. The anti-Western regime of 1979 is still in power. If you doubt that, watch the videos of the charming “Death to America” rallies held across Iran earlier this month. Rallies like that are organized by the regime. This isn’t complicated. If Iran wanted only civilian nuclear power, it would make that clear. Instead, it has repeatedly been caught cheating, it is developing long-range missiles, and it demands the right to unlimited nuclear research, with no accountability for its past lies. This is the behavior of a nation that wants a nuclear weapon and a means of delivering it, and is only interested in stalling until it gets both. My conclusion is, therefore, simple: There is currently no basis for meaningful negotiations about the Iranian nuclear program. The Israelis fear an Iranian bomb would be used to destroy them; merely having the bomb would allow Iran to intimidate its neighbors. That’s why the time isn’t ripe for a negotiated solution to the Iranian nuclear problem. Iran views its program as an opportunity, not a problem. The United States and its allies can’t bribe Iran into giving up this program, and we have decided not to threaten Iran into giving it up. Iran is therefore going to continue to build its bomb. The only agreement we could make with Iran now is to accept that it is not going to quit. If we want to change this unhappy state of affairs, we have two options: Use the threat of military force to bring the existing regime seriously to the table, or reimpose tough sanctions with the goal of bringing a better government to power. Unfortunately, we are doing neither, because the administration wants a deal badly. But when you want a deal badly, all you get is a bad deal. Ted R. Bromund is a senior research fellow in The Heritage Foundation’s Thatcher Center for Freedom. After a brief flicker of optimism, bilateral relations have soured once again. In early November, a suicide bomber detonated himself at a checkpoint on the Pakistani side of the Wagah border, killing sixty people. Immediately after, Hamid Gul, the former chief of the ISI, Pakistan’s powerful military-controlled intelligence agency, gave an interview on Pakistani television accusing India of being behind the attack. “We offered our hand in friendship, and this is how they repay us,” he said. Despite the fact that the attack was claimed by three different militant groups based in Pakistan, many Pakistanis shares Gul’s sentiments. And given how bad relations between the two countries have been recently, that should not surprise. For a brief moment after Indian Prime Minister Narendra Modi’s election victory, there was optimism in both India and Pakistan. In an unprecedented move, Modi invited his Pakistani counterpart Nawaz Sharif to attend his inauguration ceremony. The previous year, when Sharif was contesting his own elections, he made bettering relations with India – “normalization” as both Pakistan and India call it – a campaign promise. Many thought that with two governments both interested in normalization, both having secured solid majorities in their respective election victories and facing little domestic political opposition, it was finally time for the nuclear-armed rivals to move forward. Unfortunately, it has all been downhill since. Modi has virtually ignored Pakistan, scuttling scheduled talks on the pretext that Pakistan was communicating with separatists from the disputed Kashmir region. He issued a series of statements accusing Pakistan of “waging a proxy war of terrorism,” including a speech in the Kashmiri town of Kargil, where both countries fought a mini-war in 1999. An opportunity to meet in New York on the sidelines of the UN General Assembly in September was spurned; both countries have been tight-lipped over a possible meeting at the upcoming SAARC summit in Kathmandu next week, neither showing much optimism. The diplomatic fallout has had lethal consequences. Within the past few months, border security forces have engaged in heavy shelling across the border, killing dozens of civilians and security personnel, shattering a ceasefire that has held for the better part of a decade. Given the initial optimism, why has the relationship soured so quickly? The smiles and handshakes at Modi’s inauguration notwithstanding, perhaps a more prescient symbol of the relationship was on display in Herat, where four heavily armed gunmen attacked India’s consulate on the eve of the inauguration. Both Indian and Afghan security officials blamed militant groups backed and based in Pakistan, which has a history of using militant outfits as a tool of foreign policy in both Afghanistan and the disputed region of Kashmir. Many suggested that the attack was a message from the Pakistani military not just to India, but to the Sharif government as well, namely that it is the military, which relies on its rivalry with India to justify its disproportional budget, that ultimately decides Pakistan’s foreign policy – not Sharif. It is hard to argue with that: Under military pressure, Sharif reneged on a promise to grant India “most-favored nation” status despite renaming it “non-discriminatory market access,” a policy meant to deregulate and increase bilateral trade. The military’s unwillingness to improve relations also reflects just how deeply antipathy towards India is embedded within its ranks. Despite a concerted military campaign against the Taliban in Pakistan’s tribal areas, the military is unwilling to dismiss its policy of patronizing militant groups that target India. The policy, known derisively as “good Taliban, bad Taliban” by critics, asserts that the Pakistan military is only interested in fighting militants that threaten it directly. Others, like the Haqqani Network, which primarily targets NATO and Afghan forces, or Lashkar-e-Taiba, which primarily attacks India, are either tolerated or, in some cases, provided with support. Hafiz Saeed, the leader of Lashkar-e-Taiba, which conducted the 2008 Mumbai attacks that killed 162 people, roams freely in Lahore with a security detail granted by the government despite repeated calls from India and the United States for his arrest (the United States has even put a $10 million bounty on his head). His continued freedom encourages India to believe that Pakistan is still not serious about tackling its various militants, particularly those who target India. Sharif has also been severely weakened by protests across the country led by opposition politicians Imran Khan and Tahirul Qadri, both accusing Sharif of rigging last year’s elections and calling for his ouster. Protesters staged a sit-in for months right in front of parliament, leading to a cancellation of many foreign visits, including one by Chinese President Xi Jinping (who still went to India, his next scheduled stop). Sharif has lost much of his legitimacy and political capital, and is unable to carry out many of his proposed policies, given the strength of the opposition. Modi’s party, the Hindu nationalist BJP, had always accused the previous Congress government of being “soft” on national security, and promised to conduct a more “muscular” foreign policy once in power. This meant a less friendly approach to Pakistan than that of his predecessor, Manmohan Singh, who was seen as more amenable to a deal. Since coming to power, Modi’s administration has been combative in its statements, especially in the wake of the cross-border shelling. His right-hand man and the BJP’s current president Amit Shah said the Indian government would give “a befitting reply” to the shelling that the Indian government alleged was started by Pakistan. While the fiery speeches might reflect domestic concerns – the BJP faces tough competition from the ruling National Conference party in local elections next month – they have had an adverse impact on Pakistani diplomatic efforts, which have been discouraged by what they see as a lack of reciprocation. Modi also seems to be more preoccupied with his other campaign promise, making India a global power. Since he became prime minister, Modi has made significant efforts to improve relations with the United States, Japan, China and most recently Australia, where he recently attended the G-20 summit. Given that his stated priority is improving and liberalizing India’s economy, Modi may have concluded that spending precious political capital on Pakistan is useless unless Pakistan is fully committed to peace, which it simply cannot be as long as its military is interfering in politics. Given India’s superior military and its significant presence in Kashmir, and given the relative infrequency of terror attacks, Modi perhaps believes that India can afford to ignore Pakistan for the time being while he focuses on bagging trade deals and investment contracts from elsewhere. The two governments, however, remain immune to this bonhomie. The impasse comes at a inopportune time. Climate change threatens precious water resources India and Pakistan share, as well as the ability of both countries to feed their citizens. Despite (or perhaps because of) India’s heavy military presence, Kashmir continues to simmer, always close to boiling over. As NATO forces leave Afghanistan, regional powers including Iran, China, Pakistan and India jostle for influence. With both Indian and Pakistani military budgets – and nuclear stockpiles – increasing, South Asia is heading towards a nuclear arms race, endangering the stability of the region and its economic integration. All of these issues have direct repercussions for South Asia’s security and well-being, and will require concerted and protracted negotiation and cooperation. In the current circumstances, that seems very unlikely. Saim Saeed is a journalist working at The Express Tribune in Karachi, Pakistan. His work has been published in the New York Times, Al Jazeera America, and The American Interest. Iran and Israel face off against one another in several areas but are geographically separated. It is not likely that Iran will ever face the Israeli army on some battlefield around Tehran or even on the Iraqi border. No one should be in any doubt that the US would like to remove the current regime in Iran. For more than three decades, the US has maintained an aggressive posture against Iran. It has forced sanctions on Iran and has frozen Iranian assets in the US. Iranians believe that the frozen assets are now worth billions of dollars. The US’s attack on Iraq added fuel to the escalating confrontation between the two countries. The US wanted to establish a presence in Iraq to remove the current Iranian regime but committed several strategic blunders, allowing Iran to stand favourably with the Shia majority in Iraq. Now Iran is in a position to challenge the US’s interests in Iraq and other parts of the Middle East. The crisis in Iraq is also forcing the US to look at options that can help salvage a dismal situation. The US and Iran are both feeling the heat in this area. A divided Iraq, without a moderate government in Iran, could become a bastion of Shia fundamentalism in an increasingly sectarian Middle East. Given the difficulties in Iraq, Iran’s nuclear weapons acquisition programme sounds a 10 fire alarm for the US. On the Iranian side, a military standoff with the US could be disastrous. The proliferation of nuclear states in the region and hostile relations with Israel do provide Iran with a rationale for overt or covert nuclear acquisitions. Pointing to the hostile US attitude, Iran also feels that nuclear capabilities just might save it from a surprise US military intervention. The acrimonious nature of US-Iran relations makes the US’s arguments against Iran self-serving. The US has never acted against any other nuclear state. Both India and Pakistan acquired nuclear capabilities within the full view and knowledge of the US. The superpower had been well aware of India and Pakistan’s nuclear ambitions since 1974 but never took any steps to deter either country. The Israeli nuclear programme is believed to be far more advanced than the current Iranian programme. The US’s nuclear deal with India and quiet acceptance of the Pakistani programme also set a precedent that could jeopardise the nuclear weapons control and monitoring system. There are several inconsistencies in the US’s arguments against Iran. The US emphasises that Iran is looking to acquire nuclear devices without any reason or strategic rationale. It argues that, unlike Pakistan and India, Iran does not have any historical enemy in the region that could assault Iran. Iran and Israel face off against one another in several areas but are geographically separated. It is not likely that Iran will ever face the Israeli army on some battlefield around Tehran or even on the Iraqi border. The Pakistani and Indian nuclear arsenals are country-specific. The odds of India or Pakistan using nuclear weapons against any third country are nonexistent. With the India-US nuclear deal and effective monitoring of the Pakistani programme, chances are that both India and Pakistan might never use their respective nuclear arsenals. Iran has adroitly tried to counter the US’s arguments by positioning itself as the primary opponent of Israel in the Middle East. Iran has provided military and financial help to Hamas and it has whipped up massive anti-Israeli sentiments within the Iranian population. Iran has been championing the Palestinian cause on international forums as well to promote the idea that Israel is the enemy that may attempt to destroy the Iranian state. These provocative Iranian statements about Israel are primarily aimed at whipping up a frenzy in Israel and the Israeli lobby in the US. Iran’s continued stand against Israel has indeed weakened its already unconvincing position that it does not wish to acquire nuclear weapons. With every passing day, it is becoming apparent that the solution in Iraq lies in the division of the country into Shia, Sunni and Kurd semi-independent states. The breakup of the central authority in Iraq would allow the US to maintain a permanent presence in any one of the sectors. Currently, the Islamic State (IS) insurgency in Iraq is located in the Sunni areas but could spread to other parts of Iraq. The US believes that it can suppress the insurgency in the Sunni areas if it has to only deal with a small geographic area. The Iranian government, sensing the US’s predicament, is attempting to increase its influence in the Shia areas. Thus, it aims to tie the US’s hands completely in Iraq before the division of Iraq takes place. Nuclear proliferation is not the only issue that has put Iran and the US onto the confrontational path. The cornerstone of the US’s policy in the Persian Gulf is the uninterrupted exploration, development and transportation of oil to international markets. Human rights violations by the state in Iran are also a major concern for the international community. The US is keen to resolve the Iranian conundrum and is exerting enormous pressure on Iran to soften its position on terrorism, its nuclear ambitions and the human rights situation. The primary motivating factor for the US remains oil and gas supplies to international markets. The current Iranian government is capable of disrupting the supply lines in the Persian Gulf. The US would like to see a friendly regime in Iran to ensure the potential of disruption in oil supplies is diminished or eliminated entirely. Earlier this year, the US and Iran attempted to resolve their differences. Some consensus was developed over Iran’s nuclear programme. The short-lived thaw in US-Iran relations, roundly criticised in the US, did not change the nature of differences in both countries. The Roman Effect dominates US foreign policy decisions. After 37 years of a hostile relationship with the US, Arab countries and Israel, Iran now plans to be a regional power that has some international clout. Despite Iran’s desire to acquire nuclear warheads, it lacks the capabilities needed to threaten the US’s military in the foreseeable future. Still, a minor disruption could jeopardise the US’s ambitions in the area. The region has already seen more bloody conflicts than any other part of the world in the last 30 years. The current talks over the nuclear programme present some hope but looking at the wide gulf between the two countries and the mistrust that exists, the chances are the current round of talks will merely drag on the process and no long-term solution will be reached. The countries in and around the area should brace for continued violence for some time to come. Supreme Leader Ayatollah Ali Khamenei spoke in a gathering of senior officials of Basij paramilitary force in Tehran, Iran, on Nov. 27. TEHRAN, Iran — Iran’s supreme leader, Ayatollah Ali Khamenei, expressed support Thursday for the extension of talks with Western powers on the country’s nuclear program. 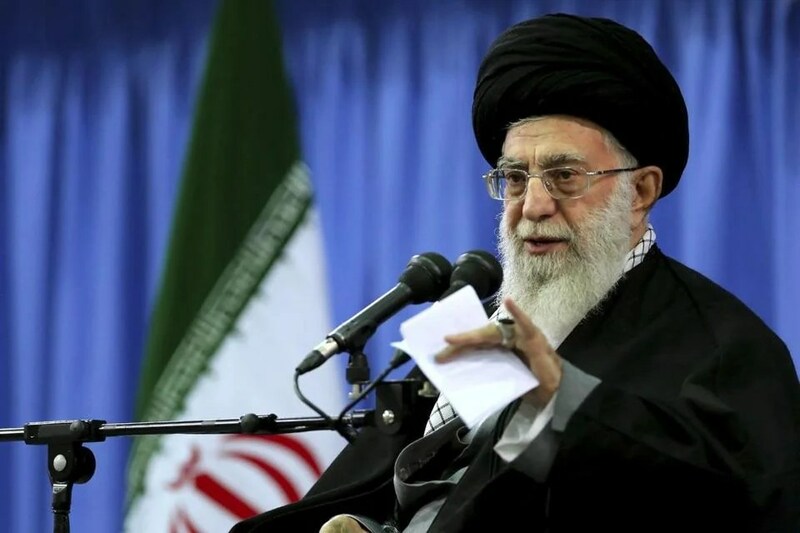 “I do not disagree with the extension of the negotiations, as I have not disagreed with negotiations in the first place,” Khamenei said in a speech published on his personal website. On Monday, hours before the deadline for the talks was to expire, negotiators in Vienna announced that the talks had been extended for another seven months. Khamenei’s opinion is crucial because he will have the final say over any potential deal on Iran’s nuclear program, which Tehran says is for peaceful purposes but the West suspects is a ruse to obscure a bomb-making effort. His remarks are almost certain to mean that Iranian hard-liners opposed to the talks, who had stepped up their criticism in recent weeks, will have to moderate their stance, and assures that politicians will not question the extension. Nonetheless, the Iranian leader attacked the United States, describing its polices as wavering and unclear. Khamenei reiterated his support for the Iranian negotiators, who in the past he has called “children of the revolution.” “They have been firm, have not caved in and are seriously trying hard,” Khamenei said. Khamenei said he was not worried about whether the negotiations would lead to a deal. “If there is no agreement, we will not lose,” Khamenei said. While the Iranian economy has been battered by sanctions and, in recent months, a plunge in oil prices, he expressed confidence that Iran can withstand the pressures. ‘‘If the negotiations do not yield results, it is America that will be the loser, as they need these talks to solve their domestic problems,” he said. Russia launched a missile that could carry 10 nuclear warheads on Friday, the second test launch of a Russian nuclear-capable missile in a month. On Wednesday, a source told Russia’s new agency TASS that the nuclear missile test firing would happen Sunday, November 30, so Friday’s launch — announced by the Russian Defense Ministry — caught the world by surprise. The “Bulava” inter-continental ballistic missile was fired from the the Alexander Nevsky nuclear submarine from a location in the Barents Sea. The missile — which of course was not carrying a nuclear payload for the test — successfully reached and hit its target on the Russian-held Kamchatka Peninsula, where the Russian Navy maintains a major presence, including a missile testing range. The Bulava missile, which Russia plans to make the backbone of its nuclear arsenal, has been plagued by misfires and technical issues. But Friday’s launch was the second successful firing of the missile within the last month. On October 29, Russia also launched a Bulava nuclear missile — that one from the other of the Russian Navy’s two newest nuclear submarines, the Yuri Dolgoruky. Both nuclear submarines are part of the state-of-the art “Borei” class. A third Borei class sub, the Vladimir Monomakh, is scheduled to enter service in December. The Russian nuclear submarine Alexander Nevsky, which successfully test-launched a Bulava nuclear missile on Friday. Despite Russia’s flagging economy, Russian President Vladimir Putin is currently overseeing a planned $500 billion defense spending spree as he attempts to re-arm the country whose military has fallen into disrepair over the past two decades, compared to the fearsome strength it displayed during the Soviet Union era. Russia’s nuclear forces will receive the lion’s share of that massive financial outlay. The Russian Navy expects to have eight Borei class nuclear submarines, each capable of firing up to 16 Bulava missiles with 10 nuclear warheads each, in the water by 2020. In another element of the Russian nuclear buildup, the country plans to revive the long-defunct Soviet-era missile trains, according to a report Thursday in the Moscow Times. A Soviet-era Russian nuclear missile train, which could launch a missile from a rail-based system moving around the country. Trains armed with nuclear missiles “increase the survivability of Russia’s nuclear arsenal, complicating efforts to locate its missiles by moving them quickly and consistently around the country,” the Moscow Times report said. A top Russian official said the decision to revive the missile train program — begun by the Soviet Union in 1987 and finally ended by Russia in 2005 — was a response to the United States Prompt Global Strike initiative. Prompt Global Strike, a system currently under development, could deliver a conventional missile attack inside Russia, or anywhere else on the planet, in no more than an hour. Currently, only a nuclear response can be carried out that quickly, with conventional strikes taking at least a day and often much longer to launch. There’s fears that members of ISIS, or the Islamic State–the terrorist group occupying much of Syria and Iraq–are currently trying to gain a foothold in Pakistan, a nuclear-armed country. And a few weeks ago, TTP leader Maulana Fazlullah expressed his support for ISIS. Last month, it was reported he pledged allegiance to the jihadist group. “In these troubled days, we call for your patience and stability, especially now that all your enemies are united against you. Please put all your rivalries behind you,” Shahid said. “All Muslims in the world have great expectations of you … We are with you, we will provide you with Mujahideen (fighters) and with every possible support,” he added, speaking to ISIS. The network said ISIS activists have been seen in Pakistan’s Peshawar city and distributed leaflets promoting the jihadi group. Also, ISIS flags have been seen in the Indian-administered territory of Kashmir. As a result, there’s been concerns that ISIS could get its hands on nuclear weapons possessed by the Pakistani government. “Although world leaders especially Americans hold several international conferences on addressing this immediate and extreme threat, there is no guarantee that terrorist organization such as ISIS won’t acquire nuclear weapons,” Khaama Press opined. It added that Pakistan’s nuclear weapons need to be “secured” to make sure ISIS doesn’t get close to them. “There are only two options that will work to make sure ISIS and other terrorist organizations do not obtain Pakistani nuclear weapons. First, the US takes control of Pakistan’s nukes and disarms Pakistan. In return, Washington can provide security guarantees to Pakistan similar to how it did with South Korea,” it adds. The site also argues that the US could help Pakistan in protecting its nuclear arsenal. “While the global leaders certainly understand that there is an extreme threat to global security if the risk that ISIS could get a hold of nuclear weapons, all world leaders, especially Americans, do is hold international conferences on addressing the issue,” added Shoebat. Every time Iraqi Shia armed groups are accused of abuses against Sunnis, the country’s Shia ruling elite comes to their defence. They even express indignation for their being called militias, insisting that they are paramilitary forces which function as back-ups to the regular security forces. But last week’s reaction to the United Arab Emirates move to include some of these militias on its new terrorism list was so furious that it almost provoked a diplomatic tussle. Iraq’s vice-president and former prime minister Nuri Al-Maliki accused the UAE of itself supporting terrorism, while some Shia leaders accused it of being sectarian. Protesters in several Shia cities demanded that the oil-rich state make an apology. The controversy started on 15 November when the UAE blacklisted 83 organisations as terrorists in line with a law it has issued to combat terrorism crimes. The measure is part of the Gulf state’s crackdown on Islamist-oriented groups deemed to be a threat to its security. Though the list includes the Islamic State (IS), the Al-Nusra Front and other jihadist groups, it also includes well-known Sunni Muslim organisations active in politics or charities. At least one UAE group, Al-Islah, which the authorities say is part of the Muslim Brotherhood, is included on the list. The UAE move has satisfied a promise by its government to crack down on Islamist political groups in co-ordination with other countries in the region such as Egypt and Saudi Arabia which also consider groups like the Muslim Brotherhood to be terrorist organisations. In August, the UAE passed a law which defined a wide range of activities as terrorism crimes. Under the law, people charged with crimes like attempts on the lives of the UAE president, the rulers of other emirates or their families, or endangering their freedoms or safety risk being sentenced to death by hanging. The law also imposes harsh punishments on other “terrorism crimes”, including attending meetings by people deemed to be terrorists. Those who “declare publicly their hostility” to the state or the regime, or show “disloyalty to the leadership”, risk being punished by ten years in jail. UAE officials did not comment on the reaction of the Iraqi Shia groups to the list, but Minister of State for Foreign Affairs Anwar Mohamed Gargash said organisations on the list could appeal to his country’s courts to revoke the decision if they could provide evidence that they were not involved in terrorist activities. While it remains unclear how the UAE measures will affect foreign organisations, the move can still carry political and moral weight. Groups which have been included on similar lists in the past have suffered from negative publicity even after they are removed from them. Terrorism branding may also have political ramifications, such as condemning the political and ideological goals of the communities the groups represent. This explains the strong reaction to the news of the inclusion of Shia militias like Asaib Al-Haq, Kataab Hizbollah and the Badr Organisation on the UAE list. These groups have joined the so-called “popular mobilisation” of Shia fighters who answered a call by Iraq’s most senior Shia cleric Ayatollah Ali Sistani to arms after the Islamic State group captured Sunni towns in the country in a major offensive in June. “We condemn these false accusations,” said a statement by the leadership of the Iraqi National Alliance, a Shia party, after an emergency meeting chaired by its head, Iraqi Foreign Minister Ibrahim Al-Jaafari, and attended by Prime Minister Haider Al-Abadi and other Shia leaders. The sharply worded statement also slammed the UAE move as “hostile” to the Iraqi people and “clear support for terrorism and criminal forces”. “It is like throwing a rescue rope to IS while it is breathing its last,” the Shia leaders said, demanding that the UAE revoke its decision. The Iraqi government, which has been reaching out to the country’s Sunni neighbours whose relations with Baghdad were strained in the years of former prime minister Nuri Al-Maliki’s rule, did not react immediately to the UAE decision. But the Alliance’s statement seems to reflect the views of Iraq’s ruling Shia elite. There is controversy in Iraq over the Shia militias, and the country’s Sunnis have accused them of committing atrocities while carrying out retaliatory attacks. Last week, Sunni vice-president Osama Al-Nujiafi told senior Shia politician and leader of the Iraqi Supreme Islamic Council Ammar Al-Hakim that the government should “put a halt to violations by irresponsible groups” against the Sunnis. The UN human rights agency and international rights groups have accused the Shia militias of gross violations, including abducting and murdering Sunnis in retaliation for attacks by IS. Amnesty International has said that the militias, armed and supported by the Iraqi government, enjoy impunity for their actions. The Al-Abadi government has vowed to rein in the Shia militias, and on Friday minister of the interior Mohammad Salim Al-Ghaban denied any connection between “these factions and the kidnapping or blackmailing of citizens.” However, Shia leader Muqtada Al-Sadr acknowledged that violations had been carried out by “some” of these militias, though he distanced his Sadrist Movement from the atrocities. “Those who terrorise people and attack them and their property are not part of our Movement. They are infiltrators who belong to enemy militias,” Al-Sadr said. Iraq’s Shia militias were created after the US-led invasion of the country in 2003 in order to fill the security vacuum and resist attacks on Shia neighbourhouds by extremist Sunni insurgents. Some of them, such as the Mahdi Army and the Asaib Ahl Al-Haq, joined armed confrontations with the US troops. The issue of the Shia militias became even more contentious after the IS advance and its seizure of nearly one-third of Iraq’s territory earlier this year. Iranian-backed Shia militias are reported to have played a key role in halting the IS onslaught, protecting the capital Baghdad and key Shia shrines and retaking key towns from the terror group. In recent months the Iraqi government has been talking about integrating the Shia militias into the security forces. It is already paying their salaries and providing them with weapons. Many of the militias also wield enormous influence in Shia neighbourhouds. They are represented in parliament and government and play an increasing role in Iraqi society. Many questions now surround the UAE’s decision to include the Iraqi Shia militias on its terrorism black list. While the UAE has not explained why the Iraqi Shia militias are on its list of terrorist organisations, the simmering sectarian crisis in Iraq has cast a shadow over the move. Many Iraqi Shias feel that they are being targeted by the Arab Sunni world as Iraq’s sectarian tensions reach fever pitch. One precondition set by the US-led international coalition to help Iraq combat IS is for a political process to be designed that will allow the various communities of Iraq to come back together. A central piece of that strategy, pushed for by the coalition, which includes the UAE and several other Arab countries, is to create a mainly Sunni national guard to police Sunni-dominated Iraqi provinces. The Shia political groups that dominate the government have been reluctant to endorse the creation of such an autonomous force for fear that it will be infiltrated by loyalists to former Iraqi president Saddam Hussein and other Sunni insurgents who might turn against the government once they are allowed to operate independently. As a counter-proposal, the Shia groups want to incorporate the Shia militias into the national guard, which, they say, should also be put under the prime minister’s command. Some Shia lawmakers say that if a bill to set up the guard comes before parliament they will insist that the Kurdish Peshmergas forces are also part of the new guard units, a move the Kurds have vehemently rejected. The fury of the Iraqi Shia leaders at the inclusion of several Iraqi Shia armed groups on the UAE terrorism list comes from the continuing ethno-sectarian tensions in the country, with Iraq’s communal factions expected to rely more heavily on their armed groups as an insurance policy. This trend is expected to continue until an all-inclusive security system is established and a political solution to Iraq’s sectarian crisis found. By branding their armed groups terrorists, the Iraqi Shias feel that there has been a deliberate attempt by some Sunni Arab governments to mix what the Shias perceive as their legitimate self-defence against terrorism with the brutal violence driven by the ideological appeals of the IS. As a result of the tectonic developments in the Middle East in recent years, the geopolitics of the region have shifted significantly. Amid 35 years of all-out sanctions and pressure on Iran, the outcomes of the Middle East’s ebbs and flows include Iran’s emergence as the most stable country in the area and as a regional power, Arab countries either in turmoil or vulnerable to unrest and destabilization and the unprecedented rise of violent extremist groups. These developments could serve as the impetus for an Iranian-Western rapprochement, despite the inconclusive talks in Vienna. The Gulf Cooperation Council (GCC) — composed of Bahrain, Kuwait, Oman, Qatar, Saudi Arabia and the United Arab Emirates — cannot counterbalance Iran due to its sheer natural weight, leverage and power in the region. They also, collectively, feel vulnerable to the not-yet-settled shocks of the Arab Spring and the rise of Sunni extremist groups such as the Islamic State (IS). In addition, Iran and Iraq, traditional regional rivals, are now heading toward alliance in the post-Saddam Hussein era. For the foreseeable future, Egypt, the most powerful Arab nation and potentially Iran’s main regional rival, seems destined to preoccupation with its worsening financial situation and assorted domestic crises, and thus unable to counter Iran’s influence and power or even play its deserved, traditional leading role in the area. The 22-member Arab League, the symbol of the Arabs’ unity and power, has practically collapsed and is largely irrelevant. In the meantime, the Arab world faces the emergence of several failed states and a growing role by Sunni extremist groups. Today, Sunni-Sunni conflicts are eclipsing Sunni-Shiite rivalries. On another front, Iran’s decades-old political forecast about the peace process has been realized. In part due to the policies of Israeli Prime Minister Benjamin Netanyahu, decades of political effort and investment by the United States in the Arab-Israeli peace process and the two-state solution have ended in failure and have heavily damaged US credibility. On another level, Netanyahu’s policies have isolated Israel more than ever, in the process drastically reducing its ability to mobilize the world against Iran. The rise of Sunni extremists employing terrorism is the No. 1 threat to international security. In this, Turkey is neither the West’s nor the Arabs’ ally in the war against IS. In assessing various alternatives for confronting IS, the West may realize that practically speaking, Iran is the region’s most resourceful and most motivated country in this regard. The coalition of Shiite forces — including Iran, the Iraqi and Syrian armies, and Hezbollah — along with the Kurdish peshmerga could form the main ground force to counter IS. Unlike the conservative Sunni Arab states, Iran finds no ideological contradiction in fighting Sunni extremists or in supporting democracy in countries like Bahrain, Iraq, Egypt and Yemen. These realities are enough reason for a West-Iran rapprochement and cooperation on regional issues. On the trade front, Europeans now more than ever want a deal with Iran so the sanctions against it can be lifted. Moreover, the European Union has little choice but to find alternative sources for natural gas to hedge against Russia cutting or severing its supply. Iran could serve as such a supplier. Moscow’s interest in defying Western policies in the Middle East is growing. Russia’s recent agreement with Iran to initially buy 500,000 barrels of Iranian oil for resale on the world market and its agreement to construct two nuclear power reactors for Tehran mean that not only has the international consensus for further sanctioning of Iran broken down, but also that the chances for undermining US-EU unilateral sanctions are growing. Against the backdrop of the grim state of so many Middle Eastern countries and Iran’s emergence as a stable regional power most naturally suited for combattng terrorism, an agreement between Iran and the P5+1 nations — China, France, Russia, the United Kingdom, United States and Germany — could pave the way for cooperation between Iran and the West to restore stability in the region and the broader Muslim world. This would also remove the threat of further nuclear and terrorism proliferation and with it additional instability. A face-saving nuclear deal could provide an opportunity for creative diplomacy to replace the 35-year-old regional cold war with peaceful coexistence and the establishment of a regional cooperation system among the GCC states, Iran and Iraq. Much has been written about the nuclear negotiations with Iran. While diplomacy has received a great deal of attention, one important question too often gets lost in the details: why Iran must not get the bomb. In my view, the answer is quite simple. An Iran armed with nuclear weapons would pose a grave threat not only to world peace but to the Iranian people. Many academics now agree with his contention that nuclear weapons discourage warfare between the states that possess them, stabilise international relations, and encourage world leaders to be more cautious. That argument does, in fact, accurately describe the recent diplomatic history of nuclear weapon states. But it reveals nothing about the future. It’s true – until one day, it isn’t. Every country that possesses nuclear weapons must contend with their inherent risks. They are the most dangerous machines ever invented, extremely difficult to manage, for reasons both technical and administrative. Like every man made object, they are imperfect. And so are the people who control them. The US first devised this technology, perfected it, gained more experience with it than any other nation – and yet has come close on numerous occasions to having American cities destroyed accidentally by American nuclear weapons. Political instability in almost half the countries with nuclear weapons has been a potential source of catastrophe. Split-second decision-making has brought the world close to nuclear war more than once and then narrowly averted it. The Pentagon has long claimed that only 32 serious accidents have occurred with American nuclear weapons. But a document that I obtained through the Freedom of Information Act listed more than a thousand accidents involving US nuclear weapons just between the years of 1950 and 1968. Many of those accidents were trivial; others were more likely to produce a full-scale nuclear detonation than some of the accidents on the official list. Seemingly innocuous things could have led to disaster. A tiny metal nut that came off a screw inside a B-52 bomber created a new electrical pathway, circumventing a safety switch and fully arming four hydrogen bombs. A maintenance technician investigating a faulty intruder alarm at a missile silo pulled the wrong fuse with a screwdriver, caused a short circuit, and blew the warhead off a missile. Four rubber seat cushions inadvertently stowed near a heat vent in the cockpit of a B-52 set the plane on fire, forced the crew to bail out mid-flight, and could have detonated hydrogen bombs at one of America’s most important, top-secret military installations. Five years ago Iran was wracked by massive demonstrations; the “green movement” seeking democracy was violently suppressed. Political instability and nuclear weapons are not a good combination. According to Bruno Tertrais, a former official in the French ministry of defence and a proliferation expert, four of the nine countries that now possess nuclear weapons are “known to have undergone severe political crises affecting nuclear security and/or control of use in one way or another”. A recent book edited by Tertrais and Henry Sokolski, a former Pentagon official, describes how a group of French generals plotting a coup against President De Gaulle in the spring of 1961 tried to obtain a nuclear device that France was about to test in the Algerian desert. “Refrain from detonating your little bomb,” one of the generals told the commander in charge of the test. “Keep it for us, it will always be useful.” De Gaulle ordered the device to be set off earlier than planned, and the coup was unsuccessful. During the Cultural Revolution in China, members of the red guards launched a missile with a nuclear warhead on a flight path over populated areas – an extremely risky and perhaps unauthorised launch. For a few days in the summer of 1991, all three “chegets”, the small handheld devices that controlled the Soviet Union’s nuclear arsenal, were in the hands of military officials trying to seize power and overthrow President Mikhail Gorbachev. And Pakistan, the nation with the world’s fastest-growing nuclear arsenal, has had three military coups since the late 1960s, four prime ministers removed from power since the late 1980s, and an Islamist insurgency determined to topple the government. Even with the best of intentions and a sincere desire to avoid nuclear war, the complexity of weapons systems, the unreliability of communications systems and human fallibility can precipitate disaster. During the Cuban missile crisis, John F Kennedy and the Soviet leader Nikita Khruschev did all they could to avoid a conflict. And yet events beyond their knowledge or control – an American U-2 spy plane that accidentally strayed into Soviet territory, the test of an American ballistic missile without Kennedy’s approval, the delegation of authority for the use of nuclear weapons to Soviet commanders in Cuba and the captains of Soviet submarines – almost started a war that neither leader wanted. On October 27 1962, off the coast of Cuba, when American forces dropped practice depth charges to force a Soviet submarine to the surface, two of the three officers in charge of the sub voted to respond by firing nuclear weapons. They mistakenly believed the submarine was under attack. Vasili Arkhipov, the second-in-command, refused to authorise the use of nuclear weapons, and the vote to do so had to be unanimous. Arkhipov’s refusal prevented the world’s first nuclear war. Given Iran’s technical, political and leadership challenges, its pursuit of nuclear weapons seems an invitation to disaster. Moreover, Iran signed the nuclear non-proliferation treaty in 1970. Getting the bomb would violate that treaty, encourage other countries to violate it and discourage Israel from ever submitting nuclear facilities to international inspection. A nuclear arms race in the Middle East would endanger every country in the region; the effects of a nuclear detonation would spread without regard to national borders. And possessing nuclear weapons would make Iran the target of other nuclear states. Early next month, officials from 150 countries meet in Vienna to discuss the humanitarian impact of nuclear weapons and a treaty to ban them. The world was lucky in the 20th century to avoid a nuclear Armageddon. In the 21st century a new international consensus is emerging: nuclear weapons are only useful for killing or terrorising civilians. The number of weapons worldwide must be reduced with the goal of some day reaching zero. A new nuclear arms race, new states possessing nuclear weapons, and a breakdown of the nonproliferation regime are the antithesis of those goals. And that, among many other reasons, is why Iran must not get the bomb. President Rouhani is the face, Ayatollah Khamenei is the master. When negotiating with a theological absolutist, excessive flexibility is not a good idea. And yet abundant flexibility is the cornerstone of Barack Obama’s present negotiating strategy. On Monday evening in Vienna, John Kerry announced a seven-month extension to the nuclear negotiations. He claimed it’s the common-sense approach. It’s not. It’s a grievous error. With another deadline expired, Khamenei is empowered. Recognising President Obama’s desperation, Khamenei has realised that waiting will bring no new penalties, and he is refusing to authorise Rouhani to make real concessions. And while some claim the negotiations are making progress, the record suggests otherwise. Iran continues to obstruct the IAEA by concealing its weaponisation programmes and demanding retention of its plutonium facility at Arak. Iran insists it be allowed to keep tens of thousands of centrifuges after any deal, and that the sanctions be removed immediately rather than progressively. Iran refuses a robust inspections regime. There’s only one way this recalcitrance can be resolved: President Obama must alter Ayatollah Khamenei’s strategic calculations. To do so, he needs to escalate his military threats against the Islamic Republic. The military option against Iran is inherently complicated. Much of Iran’s nuclear infrastructure is hardened against aerial attack. This means that any operation would, at best, only degrade Iran’s nuclear capability for three to four years. Still, that doesn’t mean the military option is false. The US military has highly advanced bunker penetration munitions and could launch multiple attacks. Of course, air strikes would also risk Iranian retaliation through missile attacks, small boat attacks in the Persian Gulf, or terrorism from the Islamic Republic’s intelligence and proxy networks. Yet the risks of a nuclear armed Iran are far greater. Were Iran to gain nuclear weapons, its violent revolutionary project would go radioactive. Today’s political situations in Lebanon and Iraq attest to what this would mean. Because in Beirut, Baghdad and beyond, Iran uses a toxic mix of violence and brutal political blackmail to advance its sectarian agenda: the expansion of Khomeini’s “jurist guardianship” ideology. With nuclear weapons, however, Iran’s hardliners would have the security umbrella to redouble these efforts. In basic terms, that would mean increased terrorism and a greatly destabilising arms race across the Middle East. After all, made paranoid by Iran’s Shia expansionism, the Sunni Arab monarchies would almost certainly pursue their own nuclear weapons. Middle Eastern political instability would thus find thermonuclear expression. And an emboldened nuclear Iran would also pose a greatly increased threat to the west. Consider that in 2011, in an action approved by senior officials, Iran tried to blow up a Washington DC restaurant. In short, a nuclear armed Iran must be prevented. And if Mr Obama escalates his military threats, it can be. While Iran’s hardliners are bold, they’re also realistic. Take Qassem Suleimani, Revolutionary Guards commander of Iran’s covert-action Quds Force. At present, Suleimani is pictured nearly every day in Iraq, where he’s leading Iran’s action against the Islamic State. He’s also responsible for many attacks on US and British forces in Iraq. In every sense, he’s a hardliner. But he’s also alert to the reality of US military power. And that reflects an underlying truth. Where Isil are frothing thugs, Iran’s rulers are masters of calculation, making strategy in view of the opportunities and risks of each moment. If Mr Obama is willing to increase his pressure on the hardliners, they will be deterred. In that regard, President Obama should immediately deploy two more carrier strike groups to the Arabian Sea. Joining the current on-station group, the USS Carl Vinson, these forces would establish a US air dominance capability joined to robust fleet protection. At present, the US only has two carrier groups deployed globally. This broadcasts absent resolve. Complementing the new deployments, President Obama should also express his impatience with Iran’s diplomatic games. Abandoning his previous equivocation, in explicit language, Obama should state that he’ll use force against Iran’s nuclear program if a deal isn’t reached. Finally, Obama should explain that if Iran responds to any US action with major retaliation, he will respond with overwhelming force against Iranian military forces in the Persian Gulf and regime targets in Tehran. This is crucial; at the moment, Iran’s leaders think they’ve deterred the military option. Witnessing Mr Obama’s change of tone and its physical substance, Iran’s hardliners would quickly take notice. Coupled to continued economic sanctions and Iran’s reduced government revenue from lower oil prices, Obama’s tangible threats would challenge Iran to reconsider its strategic calculations. To be sure, serious diplomacy offers by far the best solution to this crisis. I supported last November’s six month negotiating window and I concede that any deal with have to allow Iran a low-enrichment baseline. Nevertheless, Khamenei must learn that he doesn’t hold the cards. For the cause of peace, Iran must find renewed contemplation of American military power.